A ceasefire was announced on 21st November, ending eight days of horrific bloodshed in Gaza. Has the delicate truce held over the past two months? It depends who you ask. Israelis or Gazans, each going about their daily lives on opposite sides of a border fence. There has not been a single report of a rocket fired out of Gaza since 21st November. In contrast, four Palestinians have lost their lives and over 80 have been injured by Israeli forces since then. Yet these violations have received little or no coverage in the mainstream media. Palestinian civilians, whose only crime is to live in the border areas, are terrorized on a daily basis by the Israeli army. This is what everyday life under the ceasefire has meant for them. Beit Lahiya, in the far north of the Gaza Strip is one such place. A week ago it saw the brutal murder of 20 year-old Mustafa Abu Jarad. Today, it was the site of another Israeli violation. Abdullah Marouf, 18, was in the west of Beit Lahiya, near the coast, when he was shot in the right leg by Israeli forces, fracturing both his tibia and fibula. At about 9.00 on the morning of 21st January, Abdullah was in an area approximately 250 metres from the border fence, collecting scrap metal with his two brothers. A group of five or six Palestinians they were unaquainted with were also in the vicinity, closer to the fence than they were. Abdullah had been under the impression that he would be safe, however he noticed an Israeli soldier in a watchtower on the border and others on the ground. The soldiers began firing live ammunition towards them and Abdullah was shot. 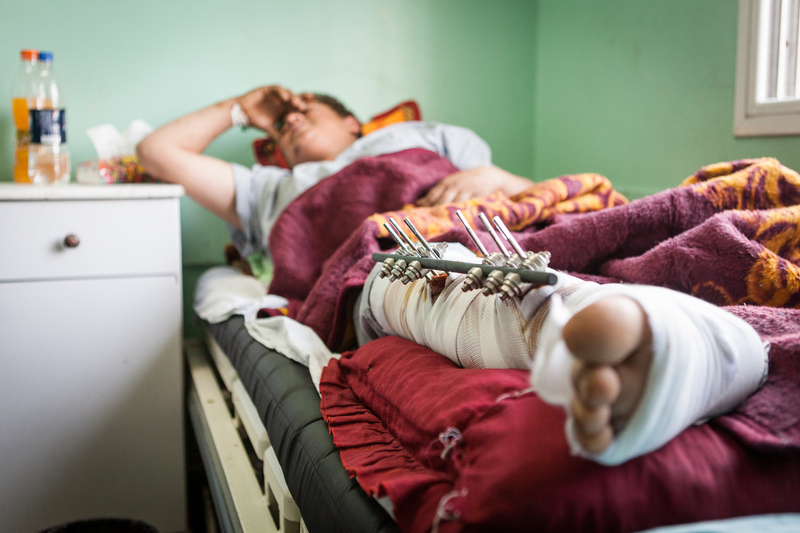 Two local farmers brought him to Kamal Adwan hospital where surgeons performed percutaneous pinning of his lower leg which had sustained damage from an entry wound and a significantly larger exit wound. He requires subsequent surgery in a couple of months to fit internal wires. His recovery is estimated to take at least 12 months. Abdullah, who is engaged to be married, had been working with his two brothers selling scrap metal. Now they will have to support a family of nine without his help. It is unsurprising that he expressed a lack of faith in the ceasefire agreement. One can only expect that the Palestinian resistance has also lost faith and is fast losing patience. If a response is provoked it will appear to be in a vacuum - despite this being far from the case - due to the shameful silence maintained by the international community throughout the ongoing Israeli atrocities. It is for people of conscience to protest this injustice and prevent a further escalation of Israel's attacks on Gaza.